Getting a working U.S.A number to use on Whatsapp has been a great deal for most of us in Africa but the tutorial that follow will make it easy . Going straight to the point, This tutorial is made for the fun of it! such number should not be made for fraudulent act. techpill will not be hold responsible. 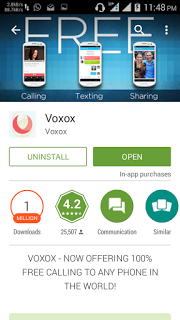 Download voxox for IOS or Android from their respective stores or here . Install and register with your current local number and country code. As you have registered for the app to more at the top right side in the app . You will see your U.S.A number as voxox number, write it somewhere or keep it I your head. Uninstall you Whatsapp and reinstall again but while registering use the USA number instead of your local number and wait for your authentication code which is supposed to be automatic . If it does not happen automatic but instead takes too long to arrive, request for call verification but instead of waiting for the call put in the code from the message in voxox which Whatsapp sent into the code space in Whatsapp .... this will verify the number hence you get to USA number on Whatsapp in your country. NB: Whats app has blocked some voxox numbers so those numbers will not work, if this happens find another number and email to register voxox with.